Details: Festival of Literary Diversity (FOLD) is Canada’s first-ever literary festival, promoting authors of colour. The three-day event happening across multiple venues in Brampton has some 30 authors. Literary heavyweights include Zarqa Nawaz, author/series creator, Little Mosque on the Prairie, Lawrence Hill (Book of Negroes), Vivek Shraya, Farzana Doctor and others. Details: Raag-Mala Society of Canada is hosting an Indian classical concert featuring Arshad Ali Khan (vocal) and Shreyas Ambikar (santoor) at the McLeod Auditorium, Medical Sciences Building, 1 King’s College Circle Toronto at 6 p.m. Details: Toronto Tabla Ensemble is celebrating its 25th anniversary with a concert at Harbourfront Centre (Brigantine Room), 235 Queens Quay West, Toronto. Ritesh Das is the artistic director and he will showcase the similarities of many musical cultures and perform original compositions by members. May 14 concert starts at 7 p.m. and on May 15 it will kick-off at 3 p.m. Details: Rosemin Bapoo will host Karamchand Persaud (vocals), Dave Bansraj (tabla) and melodies by Ami Sharma at an evening celebrating ghazals and geets. The show happening at Simply Delicious, 7850 Woodbine Ave. Markham at 8:30 p.m. Details: Bollywood actor Irrfan Khan and writer/director Anup Singh (Quissa – The Tale of Lonely Ghost) are among those celebrities that will be in Toronto for the International Film Festival of South Asia (IFFSA)/Punjabi International Film Festival taking place across various venues in the GTA. More than 80 films will be showcased at this year’s event. Details: He’s known as the “Flying Sikh” or the “Turbaned Torndado.” 100-year-old Fauja Singh is flying to Brampton to participate in the Stop Diabetes Foundations’ event happening at Canadian Convention Centre, 79 Bramsteele Rd. between 10 a.m. to 2 p.m. Details: desiFEST, an outdoor South Asian music concert will celebrate its 10th year. There’s an artists’ marketplace, food market and live entertainment planned at Yonge-Dundas Square. Oh, guess what? desiFEST, in partnership with sponsor Harley Davidson will be giving away a 2016 Street 500 valued at $7,999 to one lucky desiFEST fan. 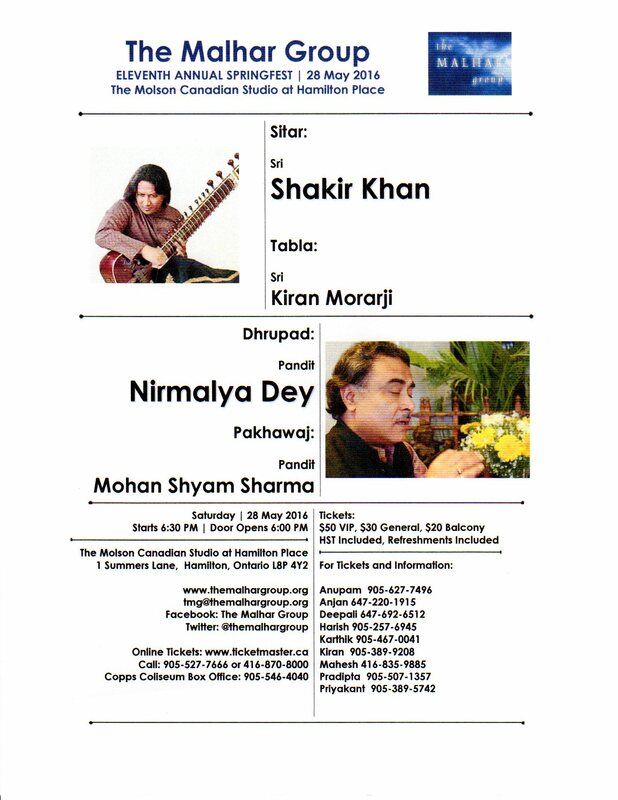 Details: The Malhar Group will be hosting Indian classical concert featuring Shakir Khan (sitar), Kiran Morarji (tabla), Nirmalya Dey (drupad), Mohan Shyam Sharma (pakhawaj) at The Molson Canadian Studio at Hamilton Place, 1 Summers Ln. Concert starts at 6:30 p.m. Details: Laughter, they say is the best medicine. So, why not show up at Albion Cinema, 1530 Albion Rd. at 7 p.m. for a poetry convention filled with humour. Who else to organize such a thing than the Uttar Pradeshis in Canada, eh? Details: PGI’s popular Masala Masti Boat Cruise VI is happening at 8 p.m. at 242 Cherry St. Toronto. There’s live entertainment, food and much more.